COWICHAN NEWS LEADER PICTORIAL – Canada Summer Games competition in Sherbrooke, Quebec proved productive for four athletes from the valley. Agnes Esser, the valley’s No. 3 Youth Athlete of the Year for 2012 and Frances Kelsey Secondary grad in June, made a strong showing in female throwing events. Esser won a gold medal for the discus with a toss of 46.16 metres that was way ahead of the 44.62 mark recorded by runner-up Kelly Kirstin Gribbons of Ontario. Esser had a personal best in the event of 49.75 during the season. She also just missed a medal in the shot put, placing fourth at 13.71. Jamie Ashcroft, a Kelsey grad in 2012, finished 11th overall in the women’s 100 metre sprint with a time of 12.75. Ashcroft has posted a personal best in the event of 12.09, which is just back of the winner’s 12.02 clocking. Para female track events resulted in bronze medals in the shot put and discus for Jessye Brockway. 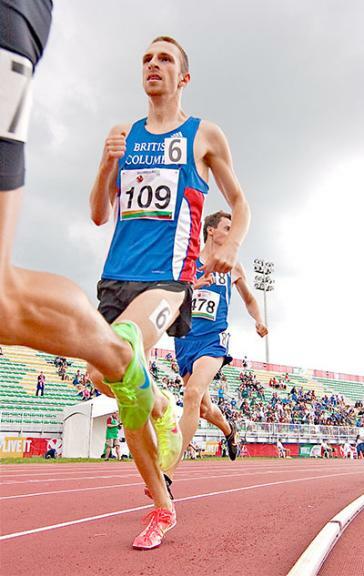 PARKSVILLE QUALICUM BEACH NEWS – Oceanside standout Thomas Riva is back from the Canada Summer Games where he capped off his season by taking gold in the 1,500m event and silver in the 800m. Simply put, “Thomas had an outstanding meet,” confirmed Oceanside Track and Field coach Kim Longmuir. Played out Aug. 2-17, the 2013 Canada Summer Games were held in Sherbrooke, Quebec, where more than 1,200 of our country’s best competed in 17 sports. Riva wasn’t available for comment, but the Kwalikum Secondary School grad was in great form at the Games where he was competing in Athletics, and was a force in the 1,500m when he lopped three seconds off his personal best time for the win at 3.45:87. In the 800m final last Friday he finished second in a time of 1:48.91. He’s currently ranked fourth in Canada in the 800m. In both events he qualified for the finals out of a field of 22. Thomas, 21, is heading into his fourth year at UVic where he’s majoring in engineering. Langley – The Canada Summer Games came to a close over the weekend with Langley athletes helping Team B.C. win another handful of medals. The Games were held in Sherbrooke, Que. Leading the way was high jumper Django Lovett, who captured the gold medal in his event. Lovett cleared 2.12m to finish atop the podium. Django Lovett won the gold medal in the high jump. He tied with Al Mansaray of Alberta at 2.14-m, but won a tiebreaker. Sam Kennedy, a graduate of Lord Tweedsmuir Secondary, won the silver medal in the women’s hammer throw. Adam Paul-Morris, 20, shared a silver medal. He ran for Team BC in the men’s 4×400-m relay Friday night. Team BC qualified with the fastest time at 3:14.91, and despite a 3:09.30 in the final, finished second to Ontario. Justin Kent won a bronze medal in the men’s 3,000-m steeplechase Tuesday night. The Kwantlen Park Secondary graduate finished in 9:10.89, 12 seconds behind the winner. Robbie Gallaugher, 22, also won a bronze medal. His leap of 7.17-m left him behind only two of 21 competitors. Gallaugher, also a Lord Tweedsmuir grad, was part of the provincial team which placed eighth in the 4×100 relay Thursday night. Riley Van Ryswyk, 19, placed fourth in the men’s pole vault, as did Kathryn Van Ryswyk, an 18-year-old who will compete next year at the University of Alberta, in the women’s pole vault. 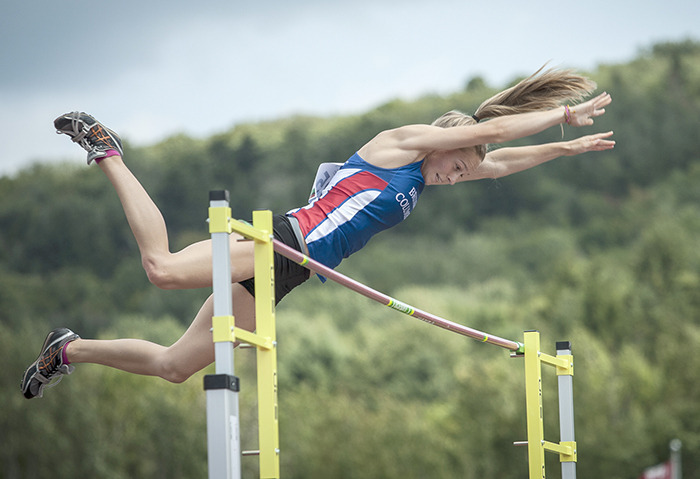 South Surrey runner Meghan Palesch – like both van Ryswyks a member of Ocean Athletics Track Club – also had a fourth-place finish, in the 400-m hurdles, while picking up a silver medal in the 4×400 relay. Sebastian Adugalski, also a member of Ocean Athletics, placed second in the ‘B’ final of the 400-m hurdles. Recent Frances Kelsey Secondary School graduate Agnes Esser topped the discus field at the Canada Summer Games, which wrapped up last Saturday, as she led a strong Cowichan contingent with Team BC in Sherbrooke, Quebec. Esser, who won gold and silver in the high school track and field championships in 2012 and 2013, respectively, won national gold at the Canada Games with a throw of 46.14 m, 1.54 m ahead of the silver medallist. She finished just outside the medals in shot put, placing fourth in Canada. Mill Bay’s Jessye Brockway came home with a pair of bronze medals, placing third in para female shot put last Monday, then duplicating that result in discus the following day. Also from the Cowichan Valley, Jamie Ashcroft finished fourth in her 100m heat and advanced to the B final, where she ended up third, placing 11th out of 23 runners in the field. Ashcroft was also part of the 4x100m relay team that placed second in its heat and fourth in the final, just missing a medal. Cobble Hill’s Maya Munzar represented B.C. in triathlon, placing 14th in the individual event and fifth in the women’s relay. Like Esser, Brockway, Ashcroft and Munzar are also Kelsey graduates. Friday August 16th marked the final day of competition at the Canada Summer Games. Team BC pulled out some great performances including a silver medal in both the 4x400m Relay for the Men’s and Women’s teams. Congratulations to all the athletes, coaches and support staff who traveled for the 2013 Canada Summer Games!